I find it so fitting because I’m not sure that I necessarily chose to go into burlesque and cabaret photography per se, more that I found myself walking through the golden doors into a life less ordinary one day and have since spent the last five years of my career surrounded by incredibly talented performers covering all genres of cabaret and circus! I’ve always wanted to do a shoot inspired by the film, so it was a real privilege to be able to work together with burlesque performer Ruby Deshabille to create this series of images. It was just after the Christmas break that I got in touch with Ruby and asked her if she was interested in working together on the Water For Elephants project with me. 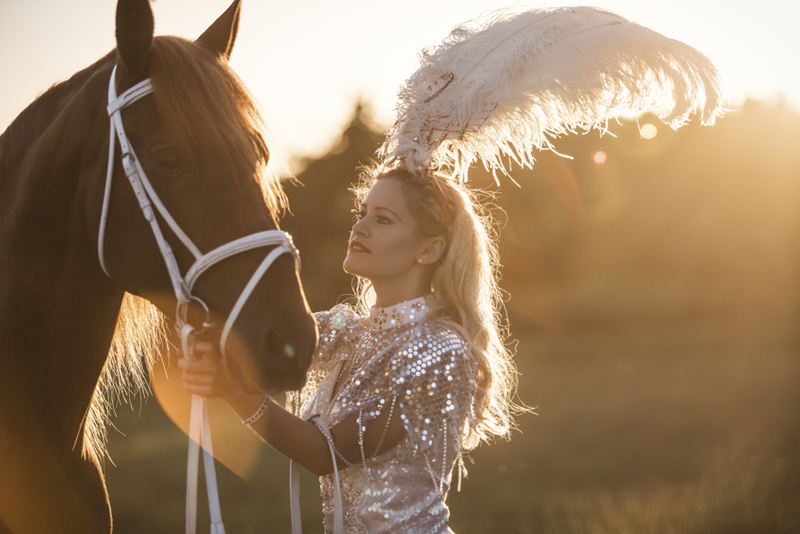 Knowing full well that it would be several months before the weather was anywhere near good enough for the shoot, it gave us plenty of time to plan, prepare and source everything we needed to make sure the shoot was a success. The first and most important task was to find a horse we could shoot with – and we certainly lucked out with the kind offer from Pete and Dom to let us use the beautiful stallion Reducto W. Deciding on a white and silver theme for Ruby’s outfit, we set a rough time frame for the shoot as May/June to catch the local lavender in full bloom and agreed to catch up in a couple of months to formulate a more rock solid plan. As the summer approached, it was clear the British weather was going to keep us guessing as to whether we’d get the weather we were hoping for! Absolutely everything was ready to go so we set a date in the diary for early June, but the weekend before the shoot all three of us had completely different weather forecasts on our various electronic devices. The night before it poured it down with rain, but we decided to take our chances and make the 2.5 hour trip down to Canterbury anyway in the hope that the weather would decide to declare itself in our favour. 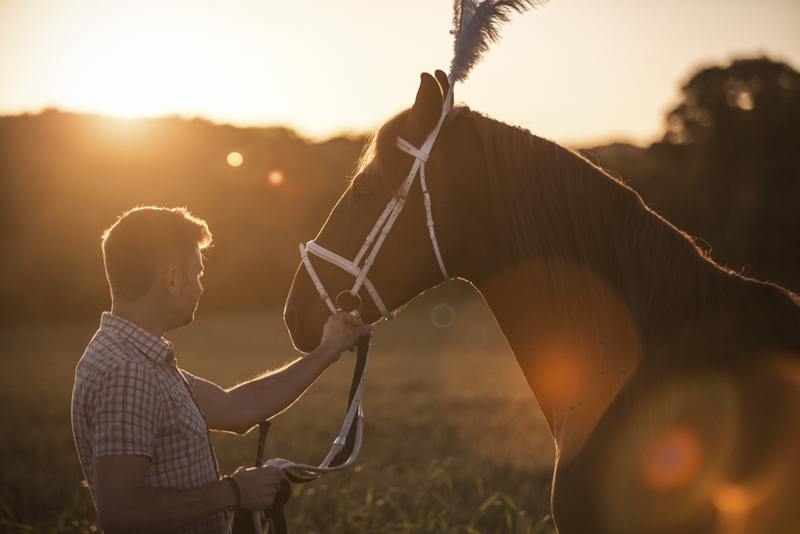 Ruby and I arrived in Canterbury around 6pm, which gave us plenty of time to get ready, assemble the Elinchrom Quadra and get out into the fields to test the conditions with Reducto before the golden hour approached at 8pm. As luck would have it, there was not a single cloud to be seen in the sky – which was a huge relief after the stormy forecast and made for some sunny summer images that look nothing like the UK at all! 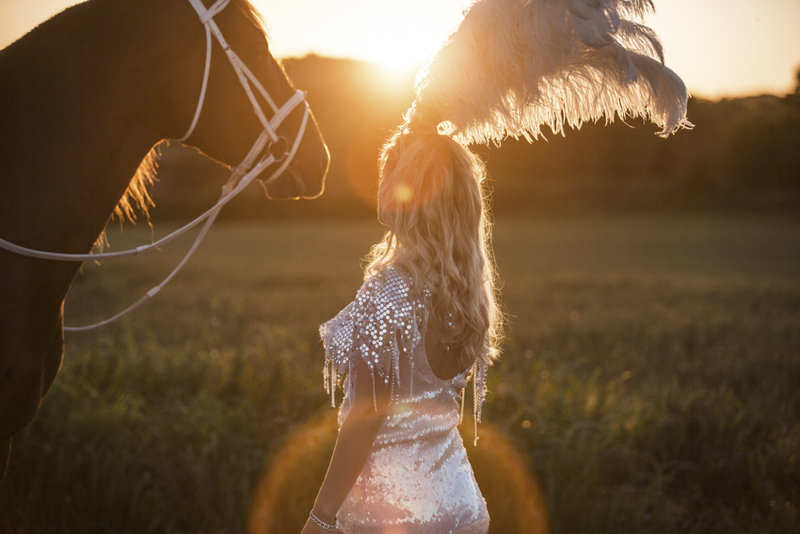 (More on these later in the week) Ruby had sourced the most incredible Water For Elephants inspired outfit for the shoot, including a white and silver sequinned vintage leotard, silver sequinned cape and a stunning white feather headdress. Not to be outdone, Pete and Dom has also kitted out Reducto W with a matching white feather plume and reigns, which really stood out on his auburn coat. Although I’ve worked with live animals on shoots before, none of them have ever been quite on the same scale as Reducto! We were lucky to have both Pete and Dom with us throughout the entire shoot, expertly guiding Reducto W into the poses I was looking for and making the whole shooting process so much easier. We genuinely couldn’t have done the shoot without their help, so a massive thank you to both of them. Here’s a behind the scenes shot of Pete in action! Whilst the plans had been to shoot in the lavender fields, the local farmer had just given the crops a quite severe haircut! But there was still plenty of colour from the surrounding fields to create a stunning colour palette. As the sun set in the sky around 8:30PM, it cast a beautiful golden orange hue over the landscape and created some spectacular golden solar flares through the lens, creating a warm glow around Ruby and Reducto. Due to the positioning of the trees, we only had about half an hour to get these images, but the whole team made sure every second counted and we left with lots of lovely images to choose from. In terms of post production, very little was done to these other than upping the clarity in Lightroom to bring out the details in the costume, a slight green desaturation and removal of some of the dirt that had transferred onto the lens from the field! 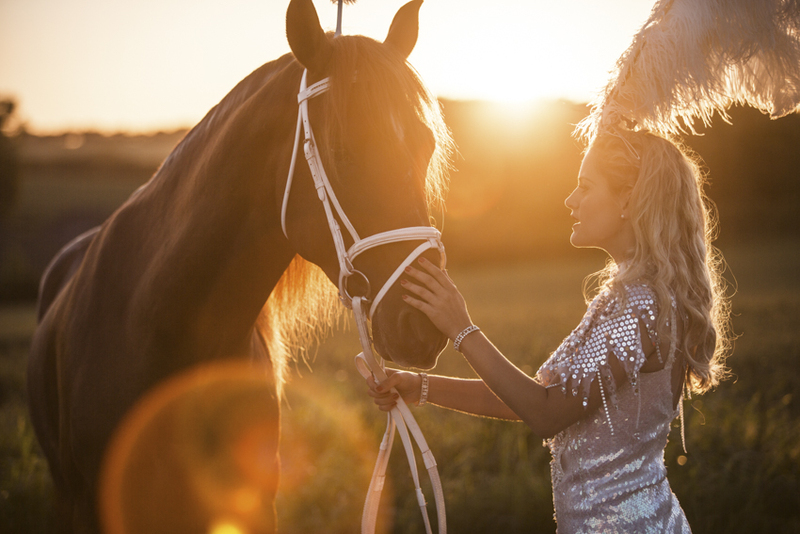 Inspired by this Water For Elephants themed shoot? Look out for Part Two later in the week. Tigz, I love these pictures. Such a wonderful theme too. I love the book and film. Corrr – those are a bit gorgeous! Hi there, where can I find that outfit please? Or something similar? The outfit is all vintage showgirl attire and was a mix of model’s own and a few generous donations for the shoot. Your best bet would be to look on Ebay, vintage stores, or look out for and showgirl clear out sales!